Memory Water pays close attention to the safety of packaging. 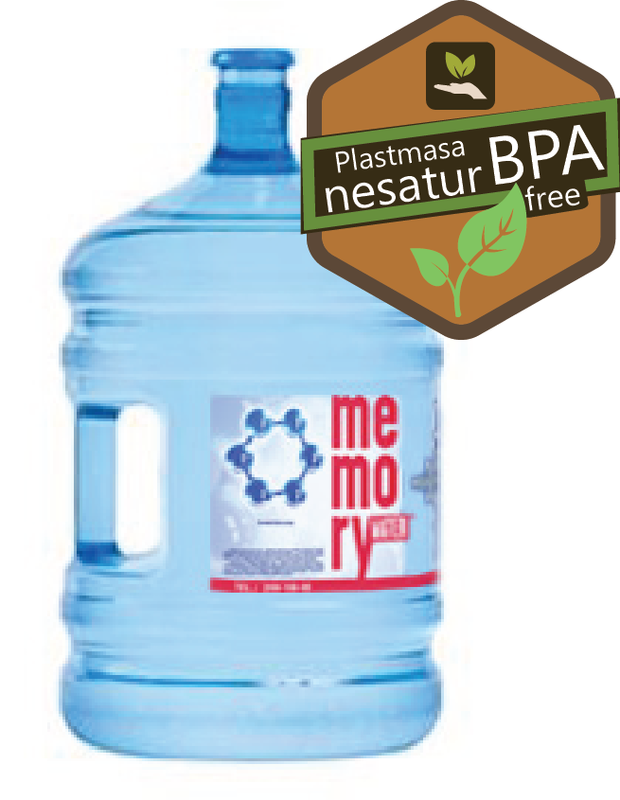 Memory Water is the only water producer in Latvia providing BPA free packaging for all water bottle volumes. Press settings and CC button for English subtitlesWhat is BPA Plastics? BPA is the abbreviation for "bisphenol A", a human-made chemical that is mainly consumed by plastic manufacturers. It was first obtained in the 19th century. With added bisphenol A, the plastic becomes harder. Since 2017 Bisphenol A is classified as a dangerous chemical in the European Union and regarded having toxic effect on human reproductive system with hazardeous category 1B. Such a decision was unanimously made by the European Chemicals Agency on January 4, 2017: (https://echa.europa.eu/candidate-list-table/-/dislist/details/0b0236e180e22414). Seemingly practical bisphenol A is able to imitate human's natural hormone estrogen and intervene in our hormonal system when it enters the body. Human hormonal system is an extremely subtle mechanism on which other vital processes depend. Hundreds of studies have shown that bisphenol A is dangerous: it can promote behavioral disorders such as hyperactivity, diabetes, obesity, breast and prostate cancer, premature puberty or, on the contrary, genital disturbance, etc. It is also clear that for young children that bisphenol A can cause more damage in very small doses as it interferes with the hormonal system at its most advanced stage of development. More than 70+ references to scientific researches are available. Bisphenol A tends to be educed and comes into our food or drink, especially at high temperatures: by heating, especially in microwaves, dishwashers, sterilizing or pouring in a bowl of hot drinks educing of BPA increases 55 times. By food and drink we receive a huge bisphenol A dose. In the United States, 93% of tested urine samples (both children and adults) this substance was found. In recent years, scientists are increasingly talking about the fact that bisphenol A is most likely to be able to destroy not only the health of small rodents. BPA has been lined up for several years now, in the hormonal system disruptor list. Just in 2010, baby bottles were mainly made of BPA plastic, and they were washed and sterilized daily. Since 2011, BPA containing bottles can no longer be manufactured or marketed throughout the European Union. However, the BPA ban applies only to baby food, not adult. The exception is France and Japan, where BPA bottles are banned at all. Bisphenol A is banned in all food packaging for children under the age of 3 in Belgium, Sweden, France and Denmark. At present (at the end of 2017), Memory Water is the only producer in Latvia offering water in 18.9l plastic bottles which do not contain BPA (Bisphenol A). From BPA plastics following items are made: regular 18.9l reusable water bottles, CDs, kitchen utensils, baby bottles and other items. Bisphenol A is also added to the coating in all kinds of cans, so that the metal does not cure and do not damage the food. PET 1 (polyethylene terephthalate). This plastic does not contain BPA (Bisphenol A). We use this plastic in small plastic bottles of 0,75 and 1,5l. PET plastic is generally recognized as safe. PC 7 (polycarbonate) labeled under the "other" plastic. This plastic contains BPA (Bisphenol A). This type of plastic is widely used in large plastic bottles - 18.9l. Large bottles can not be made of PET plastics because they are too fragile and do not hold bottles together. This plastic has been banned for baby food in the European Union since 2011. TRITAN PLASTICS. This plastic does not contain BPA (Bisphenol A). It is authorized for use in baby food. In addition, TRITAN plastics are more expensive. It's not as robust as PC plastic, TRITAN bottles have a shorter life span, which is why water producers are not surprised to introduce it in their assortment. Tritan plastic is regarded not only BPA free, but also estrogen activity free, which is the major issue regarding plastic safety. Most experience in these issues have France, where bisphenol A is completely banned in food packagingsince 1 January 2015. A safe alternative is especially necessary. The official French internet portal that offers alternatives for children lists the following materials as the safest: Polypropylene and Tritan Plastics: (https://substitution-bp.ineris.fr/en/faq/what-mate...). Tritan plastic is used by Memory Water. The effect of a plastic or glass bottle on the water structure? Undoubtedly, it would be best to use bottles of white transparent glass or copper. The problem is that 18.9l glass or metal (copper, stainless steel) bottles are very expensive and heavy. However, if there is a demand, the offer will follow. At present, the best solution is plastic bottles that do not contain Bisphenol A. From the point of view of the water structure, in all studies we have published, water was kept in plastic bottles.Therefore plastic bottle does not have a negative effect on the water structure. (1) manufacture structured water, (2) deliver healthy and organic products and (3) developing MW Institute to provide lectures, classes, consultations and treatments to help people having a happier life!